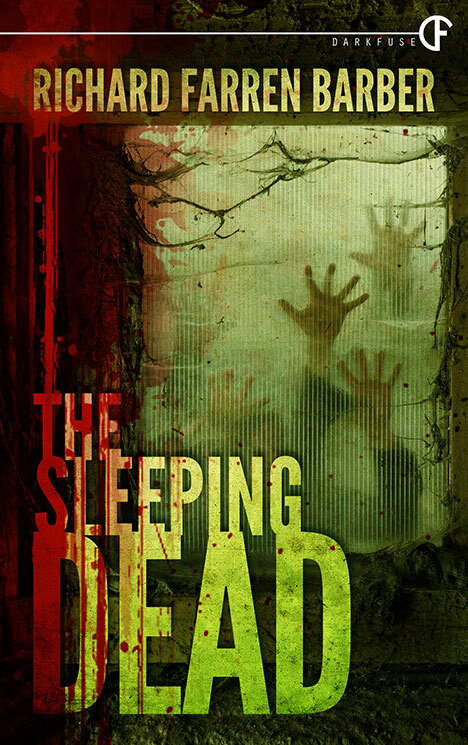 Wow, I just got an e-arc of Richard Farren Barber’s The Sleeping Dead from Dark Fuse and it’s fantastic. I reviewed another novella of Richard’s back in Oct 2013 https://horrornovelreviews.com/2013/10/02/richard-farren-barber-the-power-of-nothing-review/ and when re-reading it I thought “Geez, this first paragraph can be used to describe this book.” Mr. Barber’s writing style is so like Rod Serling. I find his stories thought provoking, with a real depth to them. Jackson was on his way to a job interview, with traffic proceeding at a snails pace Jackson becomes a bit worried about being late. Rather than ruin his chances for the job he decides to get off the bus and walk the rest of the way to MedWay offices. As he continues forward to the bridge he finds that traffic has come to a stand still and a crowd has gathered on the bridge. There is a man standing on a balustrade ready to jump. This will be Jackson’s first encounter with the madness that is about to ensue. Fast forward to the interview, Jackson is being questioned by four members of MedWay management. While the interview is taking place one of the members begins to get agitated, increasingly so until he is asked to leave the room. When the interview is concluded, Jackson heads over to the elevators where he runs into the dismissed team member, Malcolm. Jackson tries to talk to Malcolm, but it only makes matters worse. Malcolm is now trying to break through the windows as if to jump to his death. Things are getting crazier by the minute and then there are the voices. The voices that are telling Jackson to give up. Everywhere he looks people are dying. Shaken by a world gone mad, Jackson sets out to find his girlfriend Donna. Hoping that once he’s with Donna, he’ll be able to find some normalcy, in a not so normal world. This is such a good story and so hard to review without spoilers, but believe me it’s one to read. You can also check out his short story Last Christmas in Horror Novel Reviews Presents: When Red Snow Melts. See his Amazon page for more listings. This book is available for pre-order on Amazon and will be released August 12th.